Here is some of the answers you were requesting for water and aquariums. Ormus Minerals Effective Microbes Plant Microflora Dilution Ratios for Ponds and water purification. to mix the Ormus Minerals Effective Microbes Plant Microflora in the water at a ratio of 1:1000 every month to help remediate the water. This would be ¾ of a teaspoon per gallon of water or 1 ounce for a ten gallon fish tank. It is recommended that this dosage be applied in weekly increments, rather than all at once. large container in order to allow the chlorine to offgas. Before adding the replacement water, be sure to include the Ormus Minerals Plant Microflora Stimulant at the 1:1000 ratio. central spots and peripheral spots around pond edge. Healthy water gardens and small ponds offer a valued aesthetic attraction to the home or business. These pools, however, develop their own ecosystems that can easily go out of balance. If the water is left stagnant for too long, mosquitoes will start to inhabit the area, algae begins to form in the water, and odors can start to appear. Adding in a feature that circulates the water can cut down on these problems. Depending on the water quality, however, algae and calcium deposits may still form. 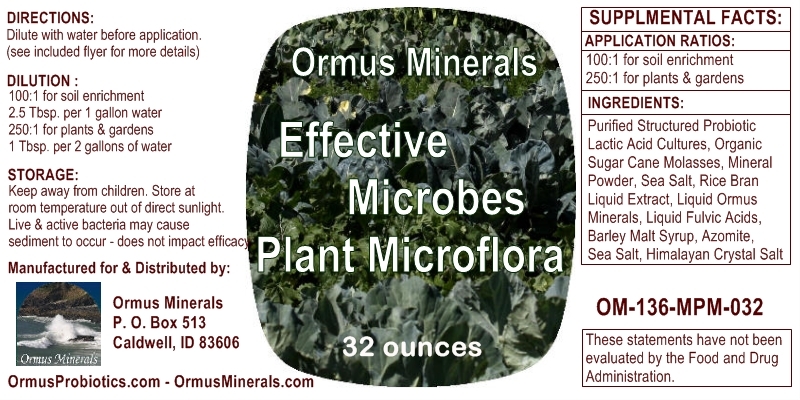 Using Ormus Minerals Effective Microbes Plant Microflora Microbial Inoculant on a regular basis will help to keep enough beneficial microbes in the system to keep nutrient levels low enough to prevent the growth of algae. Ormus Minerals Plant Microflora Stimulant also has the ability to neutralize salts—which can act as a natural chlorinator—and prevent them from crystallizing on pool surfaces. The monthly application ratio is 1:10,000, which is 1 part Ormus Minerals Plant Microflora Stimulant for every 10,000 parts of water. It is recommended that this dosage be applied in weekly increments, rather than all at once. Allow several weeks for the materials to do their work. Some sludge from the bottom will likely surface creating an unsightly scum. Leave it and let nature do its bioremediation – as it will disappear shortly. and you would like to treat it with Ormus Minerals Effective Microbes Plant Microflora, please feel free to contact OrmusMinerals.com for assistance. These programs are often done for lakes that have a surface area of several acres that are fed by outside sources (besides rainwater), or have been contaminated by chemicals. Microorganisms have much to do with the process of water purification in nature. process, microorganisms play a major role. functioning properly with a rich aquatic ecosystem pyramid. In polluted water with sludge accumulating at the bottom and foul odors, self-purification power decrease as the result of the dominance by putrefactive microorganisms. This leads to decrease of nutrition necessary for ecosystems to function and keep their purification. layer of microorganisms and help ecosystems revive and reduce sludge and foul odors. The purpose of EM application is not to create apparently-clear water by chemical means but to revive the native function of aquatic ecosystem.